Welcome to Raise Your Game! April Jaffe is a dynamic sales and marketing consultant. Her experience and insight will guide you to make effective changes needed to increase your business. Learn how to raise your game and succeed in this competitive market. With the landscape of business changing at lightning speed, we all have to be at the top of our game. We get so overwhelmed with the day-to-day business of operations that we can lose sight of how to grow. Raise Your Game can help. Our expertise in sales, social media and public relations has helped companies reach their audience and increase their business. Have an open and honest dialogue so that we can pinpoint the areas of your business that you need to focus on for growth. Make a step-by-step road map of initiatives needed for getting your business to the next level of profitability. Keep your momentum going and follow through for success. April was a joy to work with, she is definitely not your average consultant. She brings improvisation and other techniques and strategies to the table that greatly improve building relationships - not just with clients, but within the office environment. Her one-on-one attention is so important in gaining knowledge of your company and uses it to better help your company grow and change in positive ways. April is fun, intelligent and keeps her finger on the pulse of whatever industry she finds herself in. April Jaffe brings a well-needed injection of enthusiasm to every sales meeting. Her tactics and instincts on marketing/communication are spot on. She brings a wealth of creativity and understanding to the sales process that turns potential leads into professional business. It was great meeting April and the feedback from my employees on her presentation at the TSINY administrative meeting was extremely positive! April was described as excellent, energetic, creative and enthusiastic. Her team building and listening techniques were well noted and the exercises she asked staff to participate in were very well received. They specifically liked the "Shark Tank" exercise, since it gave them both a chance to work with new colleagues and to practice their presentation skills. From an executive standpoint, April allowed me to see staff out of their "everyday" roles and to get a better handle on what they are capable of accomplishing when challenged. I will definitely call upon April's services in the future. At Calabash, we have always been very focused on providing an excellent product, but we lacked the same level of focus when it came to our own marketing and sales. When we wanted to take our company to the next level, a colleague recommended that we talk to April. It was clear from the start that April had great insight into the particular challenges faced by creative companies like ours. April provided us with much-needed perspective not only in regard to sales and marketing, but also with our staff and in helping them to unlock their full potential in order to succeed personally and together as a company. April is an absolute pleasure to work with, and I feel that she has equipped us with the tools we need to achieve our goals and grow our business. I will absolutely recommend April to anyone I know that is looking to raise their game. I hired April on the recommendation of a friend in the industry. Within our first consultation, she had given me the tools to negotiate higher budgets with my clients. Literally within the first two weeks of us working together, I landed a job and negotiated a higher-than-normal budget - and that one job brought in enough extra income to pay for April's consulting. My favorite thing about working with April, however, is not only the fact that she knows how to maximize profits. She takes an adaptive, whole-business approach in consulting, making sure all of my questions are answered and all aspects of my branding, marketing ,sales and the operations of my business are working together. She's the real deal - no fluff, no time wasted. In fact, I've already passed her name to a few other friends and will continue to do so for years to come. When I took over my company I was interested in hiring an outside business consultant to keep me on track with hitting big-picture milestones. As an owner, I felt it was important to have an outside system of checks and balances and what I love about working with April is that she's very focused and detail oriented, but doesn't get hung up on the meaningless minutia. She puts our ideas into action and figures out the best means of carrying them out effectively and in a timely manner. Through her commitment to me and my company she's found a way for us to execute many of our larger initiatives and made sure they didn't get lost or delayed among our day-to-day responsibilities. She brings a great energy into our studio. I would highly recommend April to any business owner and I couldn't be more pleased with where we're at today after two years of working with Raise Your Game! After years of regional success, my company realized that the time was right to expand into the New York market. Although we had an amazing story and a great product, we needed to introduce our company with the best understanding of this highly competitive market in order to succeed. For us, that came in the way of April Jaffe. Throughout the market introduction, April's vast experience and knowledge of the industry were key factors in connecting us with top decision makers, which led to success for our New York office. She also consulted with our team on marketing and coached us in our business development efforts and messaging. Through this collaboration, we discovered some challenges in our messaging and fragmented brands. This discovery ultimately resulted in a rebrand, beginning an exciting new chapter in our company's 33-year history. April's industry insight and energy are unparalleled. Her consultation not only resulted in professional success but personal growth. 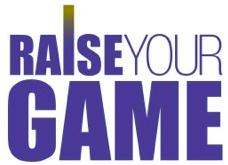 I would highly recommend hiring Raise Your Game to any company that is looking to market and grow their business. We hired a technical expert to be our only salesperson. As she had no sales experience, we hired April Jaffe to train and tutor our expert. The change was dramatic and successful. Not only were sales increased, but our expert actually enjoyed the challenge of becoming an expert salesperson. I have had the absolute pleasure of working with April as my business consultant and coach. As a new entrepreneur I was looking for someone who could not only guide me through the process of building a new businesses but more importantly turn my weaknesses into strengths and accelerate the launch of my new business. Raymond Ecke, Owner, Right Word Media, Inc. I hired April and her company to do an interactive workshop with my attorneys and support staff. The exercises and discussions employed by April were very effective and allowed me to see how creative people are at thinking on their feet and their ability to really listen. It also gave me an opportunity to evaluate how they perform under pressure. In addition, they were able to reflect on their strengths and weaknesses and how they can become more effective. In today's competitive market, professionals need to be flexible and ready when clients throw curve balls. Raise Your Game helped us take our skills to the next level. As a business owner I found it beneficial to see my attorneys and staff in action. I would recommend this workshop to any business that is interested in improving their skills and growing. April brings a great positive and inspirational energy that allows the participants to feel comfortable and learn. April is great! I have known April for over a decade. She was with Sound Lounge since its inception. Throughout her tenure she implemented sales strategies and innovative marketing ideas to help build the brand and effectively grow the business. She advised me in many disciplines, including sales, business development, and management, which helped me to develop my own professional skills. When April launched Raise Your Game, I was happy to hire her to train our salesperson with valuable guidance and unique perspective to help her succeed. What stands out about April is her intuitive understanding about people and interpersonal dynamics. She provides invaluable insight into every company she works with. She has expertise in coming into a company and being able to assess its culture and infrastructure objectively. With her natural instincts for business development, she is a valuable asset to any company. I have spent many years honing my photography skills but have never put the same effort into the marketing side of my business. I mostly avoided it because I had no idea how to go about it. Then I met April and everything changed! As I was taking photographs of April for her website, she explained to me what she did for a living. After giving me a few great suggestions, I realized April knew her stuff and I hired her on the spot. I can't say enough great things about my experience working with April. She helped me formulate a marketing plan and showed me how to implement it. She armed me with strategies on sales and marketing that I never could have come up with on my own. I was continually inspired and motivated by her knowledge and teaching skills. And she is so approachable and easy to work with that I couldn't wait for my next session. April made me equipped to grow my business. I have seen my client base continue to grow in leaps and bounds. I can truly say that April has changed my life! April brings an amazing energy and spot-on precision to her workshops. Her improvisational techniques have fit perfectly with our innovative approach to training. Her sales training expertise has helped us to take our real estate workshops to the next level and our agents to increased closings. She’s a joy to work with and her investment in our agents and their success is obvious. We look forward to creating more new and innovative workshops together. It's hard enough to succeed as an artist or an entrepreneur, but put those two pursuits together, and you can bet that the very same creative mind that's at the core of your brand and imperative for success, can be the very thing to take you down the garden path of lesser priorities as you're trying to move forward! April immediately saw that I was in that garden, and has swiftly moved me onto a high priority-driven path of goal achievement. She has brought relief and order. I believe April has the unique ability to bring in alternative perspectives of thought at just the right moments in brand and product conceptualizing conversations. And her fluency with the creative mind... well, quite simply, few consultants could bring that rare value to the table, and truly understand me. April is a door opener, a channel to hidden gems, and hiring her has been the greatest of gifts to both myself, and my business. Sherry MillsThe Relationship Artist at Sherry Mills Inc.
April is a great business ally who has lent her diverse work experience and people skills to preparing our company for its next level of success. 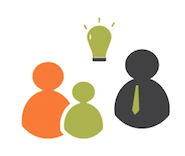 Part of running a successful business relies on the strength of human relationships. April has improved the way our company communicates between our different offices, helping us strengthen our employee relations and showing us the path to operating as a more cohesive team. In a short period of time, she was able to understand who we are as people, what makes us tick, and what opportunities we each had to reach our full potential – developing individuals in order to better develop the company as a whole. In addition to being a great communicator, April has a talent for relating to people and lending her suggestions in a style that makes sense to her audience. Any business leader willing to listen and embrace improvement will see quick results from their relationship with April. It’s been a pleasure working with her and I know I'll carry these insights with me throughout my career and beyond. She's been a great inspiration and teacher.